"Why Are Our Kerbstones History"? 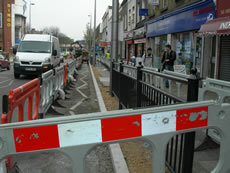 Council says works will "improve roadway condition"
Anyone who has visited Acton High Street over the past few days cannot have failed to notice a great deal of building work. W3 Forum visitor John Theodore Clarke started a thread entitled: 'Council vandalising the High Street' after he visited the High Street at the weekend. Residents subsequently expressed their amazement at the work about which Mr Clarke commented: "It looks like something off "Rogue Traders"". However, one of the construction workers told us the paving was eventually going to be renewed throughout, so the tarmac which has covered the pavements is not permanent. He also said the kerbstones needed to be replaced to make the High Street and the rest of Uxbridge Road 'uniform' all the way through. This was confirmed by a spokesman at Ealing Council who told us: "The tarmac was only a temporary measure to make the area safe as possible while works are carried out. As part of the new improvement programme we will only be using paving stones on the pavements and we won't be tarmacking anything." However, residents are fuming about the removal of the old, granite kerbstones. Peter Todd wrote: "Removing the 150 yr old craftsman-made granite kerbstones from Acton is appalling vandalism. 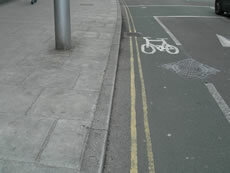 Whoever is responsible for this should be prosecuted for criminal damage." Another resident told us: "We fail to understand why Ealing Council would think it a good idea to spend so much money replacing historic kerbstones. Where have they gone? Who is going to be making money out of selling off our historic pavement? Surely there are better ways to spend money in Acton?" A Council spokesman told us: "As part of our commitment to improve the condition of roads and footways in the borough we are currently carrying out major carriageway and footpath renewal works in Acton High Street. 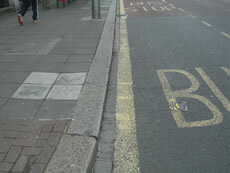 "Ealing Council is ploughing £8.5 million into road and pavement repairs in the Borough this year. This is eight times our normal budget and we are closely supervising the works. "In Acton High Street a mismatch of paving slabs from different eras is being replaced with new paving which will dramatically improve the appearance of this area. Work is due to continue over the next month and is being funded by TfL. "In keeping with the appearance of the area, new conservation kerbstones will be laid to replace the old stones many of which no longer suitable because they are damaged, uneven and tired. Answering residents who had expressed anger at the removal of granite kerbstones, the Council spokesman said: "These kerbstones are old but to call them heritage features is far fetched, they are commonplace across London, with no commercial value and so will be recycled." South Acton Councillor John Gallagher told us: "Last night I saw flagstones that were being dug up outside the library, not included in the works I was told about, being flung into lorries and broken. I would have thought that at least good material like that could be sold to reduce some of the costs." Cllr Gallagher says he was told originally the works were caused by electricity, BT and Thames Water. However, once the work had started he was told "it was not the work which everyone has been told about which has started but the work that has to be done before the notified work begins because of the end of the financial year. "Only Ealing Council would panic about spending money at the last minute and then start a competition with other utilities to cause as much disturbance as possible. It may be with us for another few weeks as well. Even then I suppose it will overrun the timetable as normally happens. Cllr Gallagher says he has received a number of complaints about the work and the disruption it has caused. Ealing Council says: "The resurfacing of the carriageway commenced on Monday 21st April and will be completed by Friday night 25th April. This carriageway work was also programmed in a manner to reduce the time on site and to minimise disruption to all road users. The paving replacement work will continue for the next four and a half weeks, and should be completed by the end of May."